Salmon is definitely my favorite fish of all. Smoked, or fresh, in pasta or rice, on a tart or pizza, in a sandwich or even in soup it never disappoints. 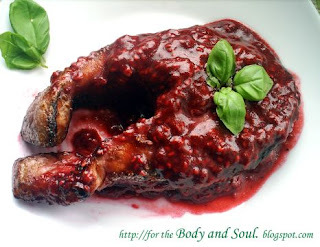 One of my very favorite ways of cooking salmon though is with this wonderful raspberry sauce. The recipe for this delicious salmon comes from a leaflet I picked up at a grocery store in Québec. My husband cooked it first for me one summer afternoon, after we went to pick up raspberries together. It was very romantic dinner and certainly one of the most delicious meals I’ve ever had in my life. The combination of sweet and slightly sour flavors of the sauce is just a perfect compliment to the moist and delicate fish. The dish is simple and quick, looking a little sophisticated at the same time. Served with green vegetables it would make perfect romantic dinner for two, and since the Valentine’s Day is coming up, I thought it's just the right time to make it again and blog about it. Notes to the recipe: You can use either fresh or frozen raspberries in this recipe. If raspberry vinegar isn't available for you, increase the amount of balsamic vinegar instead. If you don't have indoor grill, you can broil or bake the salmon. Not actually the same, but it's the best alternative to grill I can think of. 1. Clean and season the salmon with salt and pepper. 2. Place the raspberries in a small bowl, crush with a fork. Add jam, vinegars, oil, lemon juice and lemon zest. Stir until well combined. 3. Place the salmon in a dish, pour the marinade over the salmon, marinate in the refrigerator for at least one hour. 4. Remove the salmon from the marinade. Grill the salmon on medium hot grill, turning once during cooking. 5. In the meantime, transfer marinade to a small pan. Bring to boil over low heat, cook stirring constantly until lightly thickened. 6. Serve the salmon hot, topped with warm raspberry sauce. Decorate with fresh mint or basil leaves. I love salmon too, and this recipe sounds wonderful, I never would have thought of a raspberry sauce! I love salmon and my children too. I will try your recette as soon as possible and we'll see... It seems to be delicious!